Last year, James Diekmann wrote a post comparing GC-VUV to UV-Visible spectrophotometers and synchrotron laboratories, which are all techniques that analyze molecules using UV radiation. Personally, I’ve had marginal experience with UV-Vis, and I only just learned about synchrotron laboratories from James. However, while in school, I spent quite a bit of my lab time using photodiode array (PDA) detectors with high performance liquid chromatography (HPLC). Like GC-VUV, UV-Vis, and synchrotron, HPLC-PDA uses UV radiation to detect and characterize compounds in samples, and it can even be used to perform spectral matching in a similar manner to GC-VUV. So, how does GC-VUV stack up against HPLC-PDA? Let’s see! Let’s start with the wavelength range. Most PDA detectors have a wavelength range of 200-800 nm while the VGA-101 has a range of 125-430 nm. 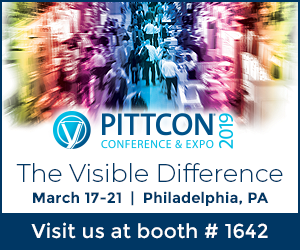 You might be wondering – wouldn’t the PDA’s larger wavelength range be advantageous over the VUV detection range? In short, nope! As it turns out, the size of the wavelength range isn’t as important as what part of the UV spectrum is being analyzed. VUV has a distinct advantage here because almost all compounds absorb in the 125-240 nm range, but only some compounds absorb at 200-800 nm. To explain why, we need to dive into a little molecular spectroscopy. There are 3 groups of electrons that may absorb in the UV range: sigma (σ), pi (π), and non-bonding (n) (Figure 1). These groups of electrons absorb light at different wavelengths: n electrons absorb around 200-780 nm, π electrons absorb around 150-250 nm, and σ electrons absorb at <150 nm (Figure 2). For this reason, a VGA-101 can see all three types of electrons and garner a lot more spectral detail than a PDA, which can only see n electrons and some π electrons. 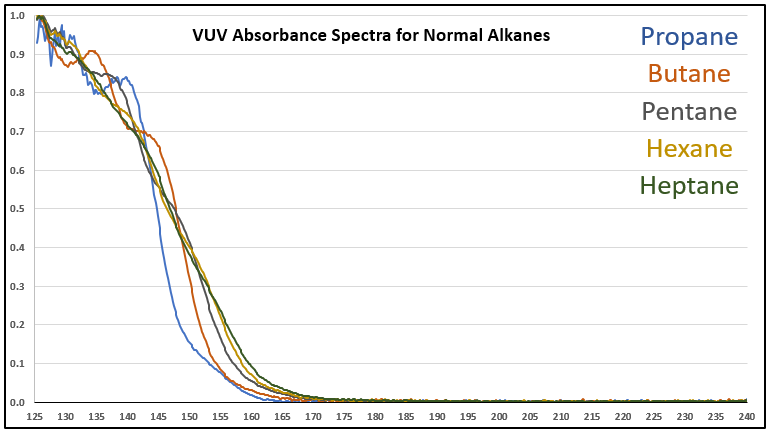 VUV’s spectral detail allows for spectral fingerprinting of individual compounds, even if they are isomers. So why can’t PDA detectors go lower than 200 nm? Remember that PDA detectors are generally paired with HPLC. Unlike GC, which uses a spectrally invisible carrier gas like helium to push compounds through a column, HPLC relies on liquid solvents to push everything through. Unfortunately, these solvents start to absorb under 200 nm, so the PDA detector wouldn’t be able to see any sample molecules under the relative ocean of solvent molecules. For this reason, PDA detectors have a blind spot when it comes to spectral matching. The VUV detector, on the other hand, was designed from the ground-up to identify compounds by their spectral fingerprints. Figure 1. 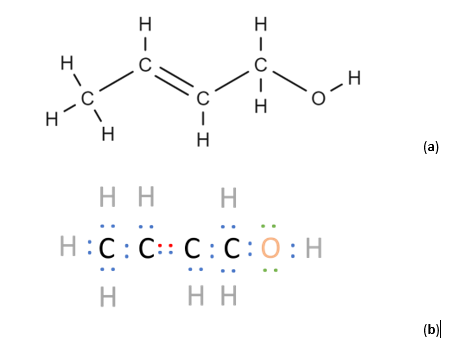 Two representations of a 2-Buten-1-ol molecule are shown in (a) and (b). In organic molecules, σ electrons make up single covalent bonds, π make up double/triple bonds, and n electrons are not used for bonding. The different types of electrons are color-coded in (b): blue corresponds to σ electrons, red to π electrons, and green to n electrons. Figure 2. An electron can absorb energy from light if a photon has sufficient energy to promote the electron to a higher energy level. Sigma (σ), pi (π), and non-bonding (n) electrons each absorb light within different wavelength ranges because they require different amounts of energy to be promoted.